CHARLESTON, S.C. & NEW YORK–(BUSINESS WIRE)–Operation FINALLY HOME and Lennar are pleased to announce a new project to provide a mortgage-free home for a wounded veteran in Charleston, South Carolina this year. U.S. Army Sergeant First Class Matthew Weise and his family were surprised with the news during a live segment on FOX & Friends on New Year’s Eve Day. The Weise family thought they were in New York City to interview with a builder and were asked to appear on FOX & Friends to talk about Matthew’s invisible disabilities. Matthew was injured during three of his combat tours and suffers from Post-Traumatic Stress Disorder (PTSD) and Traumatic Brain Injury (TBI). 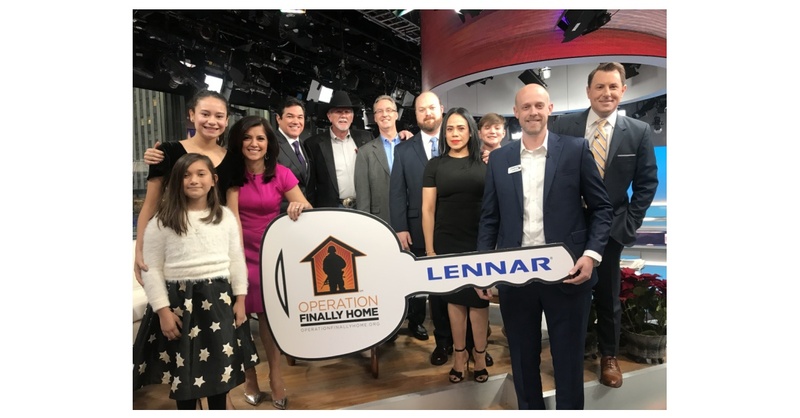 During the segment, Operation FINALLY HOME founder, Dan Wallrath, and Charleston Division President for Lennar, Jason Byham, surprised the family with the news that they were selected to receive the mortgage-free home (see video here). “Operation FINALLY HOME and Lennar have drastically changed my family's life and my outlook on the future. None of this would have been possible without them. The unimaginable gift of a house will have a huge everlasting effect on our lives,” stated Matthew following the Surprise. Operation FINALLY HOME has completed 151 mortgage-free homes and 18 home modifications to date. This will be Lennar’s fifth project partnering with Operation FINALLY HOME with plans for additional projects in the future. Lennar anticipates the home being complete this summer in time for the family to enjoy the amenities and get to know their new community and home. About U.S. Army SFC Matthew Weise | U.S. Army SFC Matthew Weise joined the army two weeks after graduating high school in Stone Mountain, Ga. He dedicated more than 15 years of his life to serving his country with six deployments, including Afghanistan and Iraq. Matthew was injured during three of his combat tours. His first injury was caused when insurgents dropped mortar bombs on the building he was in, and again when his truck drove over an underbelly improvised explosive device (IED) that knocked him unconscious. His third major injury occurred in Afghanistan when he stepped on a dismounted IED. Matthew suffers from Post-Traumatic Stress Disorder (PTSD) and Traumatic Brain Injury (TBI) as well as depression, migraines and vertigo along with seizures, neck, knee, wrist and back problems. His injuries, both mental and physical, are severe, and he describes himself as a “changed person” since medical retirement. His pain affects him daily, and he is unable to participate in many activities he used to enjoy. However, Matthew says he is looking to the future, and he loves doing volunteer work. Matthew was presented with many honors for his service including two Purple Heart Medals, two Bronze Star Medals, two Valorous Unit Awards, Combat Infantryman Badge plus many more. Matthew enjoys spending time with his family and focusing on his hobbies, such as hunting, swimming and hiking. He is looking forward to moving back to South Carolina to spend time with family and be near the beach. He also volunteers at a local food bank and counsels other veterans by reminiscing on war stories. Talking to other veterans has been therapeutic, Matthew says, and he finds it very fulfilling. His wife Saray and their children look forward to moving back to South Carolina and are all optimistic for the future. About Lennar | Lennar, founded in 1954, is one of the nation’s leading builders of quality homes for all generations. Lennar builds affordable, move-up and active adult homes primarily under the Lennar brand name. Lennar’s Financial Services segment provides mortgage financing, title insurance and closing services for both buyers of Lennar’s homes and others. Lennar’s multifamily segment is a nationwide developer of high-quality multifamily rental properties. For more information about Lennar, please visit www.lennar.com.